I am very pleased to announce that my latest book is now published and available in either print or as an ebook on Amazon. 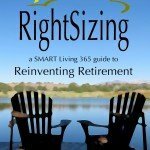 Titled Rightsizing * A SMART Living Guide to Reinventing Retirement, this book is the second in what I hope will continue to be a series. What is Rightsizing? 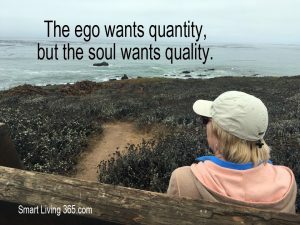 Simply put, rightsizing is the conscious choice to create a life and a lifestyle that more sustainably aligns with your unique Self in the best possible way at every stage. 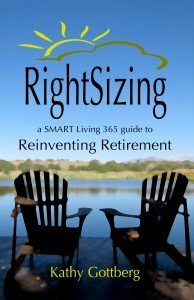 This small volume compiles the best of what I’ve written on the subject here on SMART Living 365 along with some bonus ideas that presents them in a way I think most readers will appreciate. The good thing about rightsizing your life is that it doesn’t matter what your age or situation. Although many reach retirement before finally making it happen, rightsizing can benefit everyone and leads to more happiness, fulfillment and peace of mind than ever before regardless of circumstances. Of course, just like most things that are desirable, it comes at a price. Here is a list of the most common obstacles that keep many of us from choosing a rightsized life. #1 We’re afraid of what we’d have to give up. Something that comes up continuously when I talk to others about rightsizing is how much people feel they will lose if they do it. One of the first conversations usually highlights how big and expensive a home they live in and how it’s impossible to imagine less. So many of us have identified with what we own and our “image” that we somehow believe that giving it up will be devastating. On the flip side, rightsizing asks us what we truly need to be happy and fulfilled. However, it never asks us to settle for less than what is important to us but instead makes us carefully examine the actual fulfillment we get from the things we own. In other words, do our things own us or do we own them? And are we fully awake, aware and focused on the amount of life energy we are spending to keep all those things in our life? Instead, by letting go of what we don’t actually need or want, we free up the enormous potential to live in a much more life-enhancing way. Fortunately rightsizing is all about redefining ourselves in a way that is so much MORE than our stuff. Learning to love ourselves the way we are and recognizing our innate abilities to co-create our world is far more satisfying than any amount of material goods or external power. #3 It’s easier to go through life asleep and unconscious. A great many of us live our lives on autopilot. I know I have at times. The busier we are, the more caught up we get in just about anything, the easier this becomes. It’s also not necessarily a bad thing. Allowing our unconscious to take over automatically when we’re typing, riding a bicycle or doing any one of a hundred things is a real benefit. That routine frees up our minds for more important things. The problem, of course, is that if routine becomes a habit we never bring those important things up. So we go through our days feeling like robots, going through the motions, and often living a life of quiet desperation. On the other hand, rightsizing ask us to focus in and question all the elements of our life to evaluate whether or not they are life enhancing. If something in our life doesn’t bring joy—eliminate it! If we are working on a job you hate—change it! Worried sick over the debt you are responsible for—do what is necessary to get rid of it. Got more stuff than happiness—let it go! Rightsizing asks us to stay awake, aware and focused on finding the good in our lives. #4 It’s easier to let other people make most of our big life decisions. Similar to #3 above, many of us prefer to turn over big choices and decisions to others. Any time we expect and allow a doctor, a politician, a salesperson, a child, or even a friend decide what is most life enhancing for us, we give away our power. Choosing to rightsize empowers us to decide for ourselves, and love the process at the same time. #5 We care, far more than we are willing to admit, what other people think about us. Not a day goes by that I hear or read about someone saying they don’t care what others think. Really? If we’re honest, I think most of us care most of the time. If we didn’t care, I doubt we would put ourselves through the majority of misery that we do on a regular basis. Again, let me ask a few questions? Do you routinely do things you do not love doing? Why? Why not just walk away and find something more fulfilling? Chances are, you care what others think. Want to ditch it all and travel the world? Why not? Is it because of what other people will think? Or what about deciding you wish to be a writer, a painter, or some other artist? It’s likely that you think others will not approve, so you never try. Want to stay in bed all day? Just imagine what others would think about that? Do you believe only selfish people do things that bring them joy? Who told you that and why do you believe it? Rightsizing is about doing what you feel called to do, and refusing to let others dictate the course of our lives. #6 We’d rather follow the crowd than trust our own guidance. Most of us live life based on what others told us, and what others are doing. Be a nice girl—check! Go to school—check! Get a good (and acceptable) job—check! Marry the right person—check! Buy a big house, expensive car, etc. regardless of whether you need or can afford it—check! Stick with the same job (no matter how awful) until you retire—check! Retire and play golf until it is time to die—check! Oh, wait. Why do we so often do what others expect? Because if we didn’t, we’d stand out. Most of us crave the approval of others so desperately that we sacrifice our happiness to please everyone else. Fortunately, rightsizing asks us to question ourselves deeply and for as long as necessary to find an answer—and then once we discover our true nature, we usually stop following others and instead follow that still, small voice within. We’d have to wake up and start living our lives the best we can. Rightsizing begins with the premise that the world overflows with goodness and grace and that each of us is the beneficiary to those qualities if, and when, we take the road less traveled. Rightsizing focuses on the fact that as a co-creative individual you can choose how your life will unfold, what’s important to you, and that quality experiences are always better than collecting stuff. The good news is that rightsizing isn’t difficult, and the rewards make up for any of the cost. I’ve done my best in the book to share examples of what I’ve done and what worked best for me. But bear in mind, rightsizing is an individualized approach. And now that you know what the most common blocks are, I would strongly encourage you not to wait until you are ready to retire. The SMART approach is to start today, where you are and rightsize your life. I am thinking of retirement and have been reading a variety of books, blogs and had conversations with people that I respect that I have found to be helpful. However, when I read this, it is not really what I am looking for. Frankly, I have not lived my life this way, where I look to others to validate myself. I have lived my life as I saw fit and in the knowledge that what I as doing was right and was good. To have to change at retirement seems kind of late to me. That would kind of mean that my pre-retirement life was pretty much superficial. Thankfully, it wasn’t. My main concern about retirement is who I will be letting down when I go. So I will look elsewhere, but I am sure there is an audience for this, just not me. This is so good. Working on the not caring so much about what others think! Congratulations Kathy! I am so thrilled for you. If you are looking for someone to do a book review let me know. I am so excited to read it. When my husband and I discuss this topic with our friends they all get this look of horror. As if we were suggesting they give up their first born child or something. People seem to be attached to things as if they were living, breathing things. 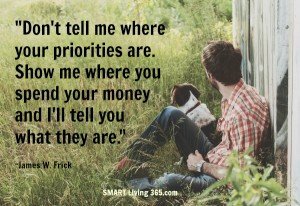 Love this list and a couple really hit home with me! Congrats on your book and this must be very exciting for you. Your article really gave me some things to think about. Very helpful. Thanks Kathy! Kathy, congrats on your new book. Ironically, we just added 300 sq feet to our small house, just as I “retired” and my daughter is moving out. Guess, I’m going backward! I read in another comment that you are going to BAM! I am too and I am looking forward to meeting you in person. I stumbled your awesome post and shared on Facebook, on my Windigen Consulting FB page. Hi Terri! Actually adding 300 necessary feet to your small house might be the perfect “rightsized” solution to your life. We were talking with friends last night who are trying to decide whether they should buy a bigger and more expensive house for when the kids and grandkids come to visit–and we suggested something like what you are doing. By adding one additional room to their house they can make it work at a much-reduced price–and they love where their home is so that’s not a sacrifice at all. Rightsizing just asks us to be mindful and aware and it sounds like you’re doing that. At the outset I would like to congratulate you for your book and wish you great success. I know your pearls of wisdom must be gleaming through it. I started Emotional Shadows to ‘let it go’…a host of emotions that keep gnawing at us, refusing to get out of our nerves. I have realized that letting go ‘our stuff’ that we kept buying over the years to sit back and enjoy when we would be having enough time is as hard as those emotions and attachments. Presently I too am in the throes of rightsizing and your thoughts are very helpful in understanding the realities we keep under the wraps, deluding ourselves as if we owe ‘the stuff’ forever! Tears are welling up in my eyes as I write this but life is like that! Thanks for an unemotional and SMART approach. Congratulations Kathy! Your thought s are so helpful and I wish you success! Some great thoughts here. Your philosophy is “right” up my alley … is the book going to be available for kindle? this was a fantastic post Kathy and I’m sure your book will be really popular. I’m sharing this on my fb page because it sums up so many of the stumbling blocks we put in place to stop ourselves creating a life that lets us be happy with what we have, where we are and allowing it to satisfy us. Wow Kathy! Another book on a practical, helpful topic. I have ordered it. I almost hate to buy something new that I “need” because then it can complicate my life…all of that packaging, instructions, set-up, tech support, batteries etc. Thanks for the reminders about Right Sizing! Congrats on your newest book! I’m sure the information you have in there (especially since you’ve lived through it all) will be very helpful for those who are considering going down the same path. I’m not sure we’ll ever make a move from our neighborhood, but downsizing is very tempting. I love the idea of freedom from too much stuff in a too-big house (we are working on the stuff). Congrats to you on your latest book! Wishing you much success! Congratulations on your book launch!! I can’t wait to get my hands on a copy! All of your points resonate, especially the one about what others think. When we rightsized and moved north last year, it was tough getting the cold shoulder by some family members. It still upsets me, though I’ve now come to realize that their behavior is more about their own issues. It touched a nerve, perhaps calling into question their own choices (or lack of them) and fears. Public opinion does affect our decisions more than we would care to admit. For years I kept quiet about the things that were important to me because friends and family didn’t share my views. Just allowing others to know I had switched to a vegetarian diet led to my having to listen to lectures and admonitions on my choice. Finally I’d had enough and wanted to live an authentic life. I downsized to a tiny apartment and found many I called my friends weren’t friends at all. They had such strong opinions it severed our relationships. Funny thing is I was very happy with the choice to “right-size” my life that instead of letting the lost relationships get to me I quit being afraid to express my opinions and found new friendships that are healthier for me. It’s hard to chip away at things we are involved in. But it’s wise to look ahead, just a bit, to decide what really matters and how much one can manage. 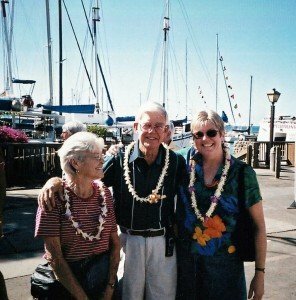 When we downsized and moved my husband wasn’t out of the woods with his clinical trial. He is doing well, but the reality is always there. Did we make the right decisions? I think so. The things I miss are mostly just STUFF. I do miss some of the experiences of our old life in Iowa, but part of living is adjustment and aging is crammed full of that. Congratulations! this sounds like a book we should all read. I know how much easier it was when we downsized our home and many of its possessions. Now I just ave to downsize my life and look forward to reading your suggestions!